I started the day being side tracked by a present from Mick. 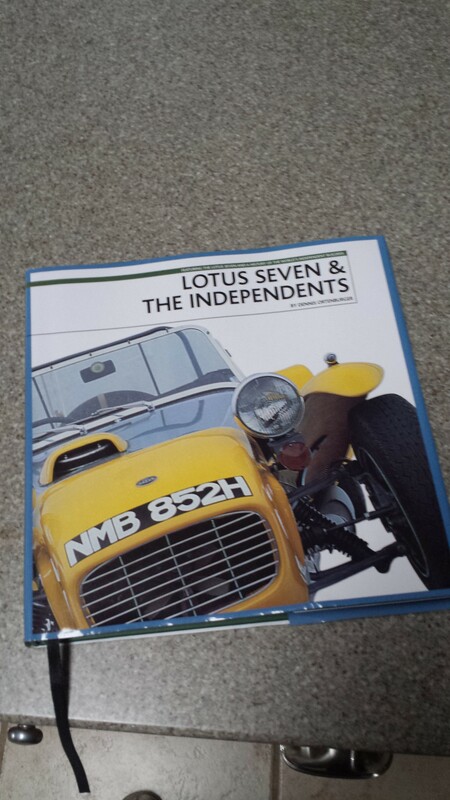 Lotus Seven & The Independents is a history book of sorts covering the origins of the Seven and all the clones since. I never knew there were so many out there! The book is done well; what started as a cursory flip through turned into a two cup of coffee delay in getting started. 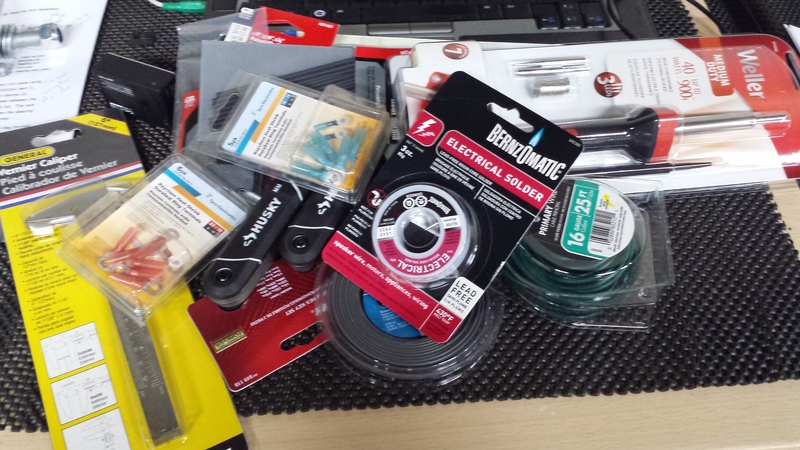 Prior to tackling the wiring I needed to make a Home Depot run for supplies. That turned into a trip to Ace Hardware too; Home Depot didn’t have all the heat shrink I thought I needed. The problem with going to either place is you find a bunch of stuff you “need” but don’t have. This trip was no different; I went in to get wire and heat shrink tubing but acquired a Vernier caliper, a metric and standard Allen key, some ring terminals, wire splices, extra 16ga wire, solder gun, solder, and heat shrink tubing of assorted sizes, none of which was entirely necessary. 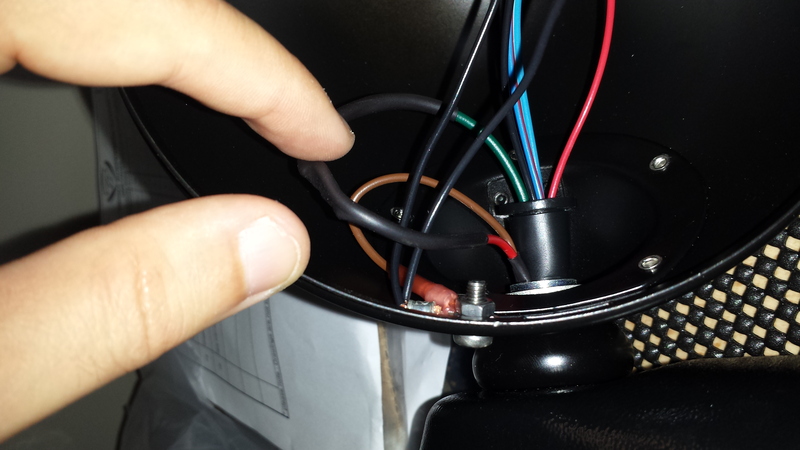 Fed the now extended red / green wire back down the headlight housing, through the rubber grommet and down the plastic tubing that came with the light. Re-assembled the headlight lens and bulbs. The light was now complete. Or so I think… no way to test it quite yet but from what I’ve read on other build blogs I believe it’s correct. 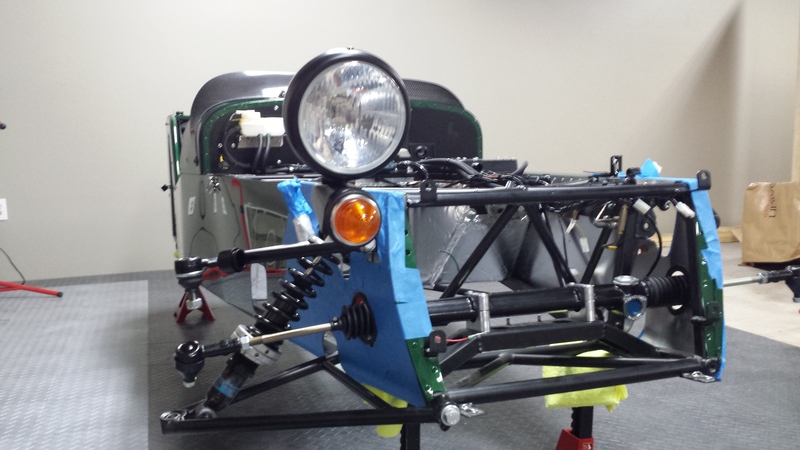 Once the mounting was complete and the wiring sorted out I mounted it to the headlight stalk and fed the plastic tubing down the inside of the stalk. Note, the plastic wrap the factor sends is NOT heat shrink tubing. It will melt before it shrinks. Don’t ask how I know. Getting it fed down the stalk is a bit of a challenge and you have to go slow with it. What seemed to work best is feed the wires down the stalk one at a time, then fold the plastic wrap into the shape of a U so its tight around the wires. Go a few millimeters at a time and with a little patience you’ll get it fed through with no problems. Once the stalk was ready to go getting it mounted to the chassis was simple. I fed the wires through the hole in the upper wishbone mount using the same ‘fold-in-half-U-shaped-technique’, after putting the rubber grommet into place, then bolted in the headlight stalk with the upper wishbone bolt and nut. Fairly straight forward, just requires some patience is all. Since the lower wishbone for the left hand side is missing I decided to stop there for the day to go ponder the differential install.